Anyone who has kids knows that they are loud. They run instead of walk. They think everything is a drum. It could be pots and pans, the ball they were just playing catch with or the kitchen table. On some days, their voice has only one volume, loud! While I love listening to Rosebud’s conversations with herself and enjoy watching her take on life with such energy and enthusiasm, I definitely need a few quiet moments here and there. Here are a few activities that can give you just that. Peace and quiet. These can contain anything. 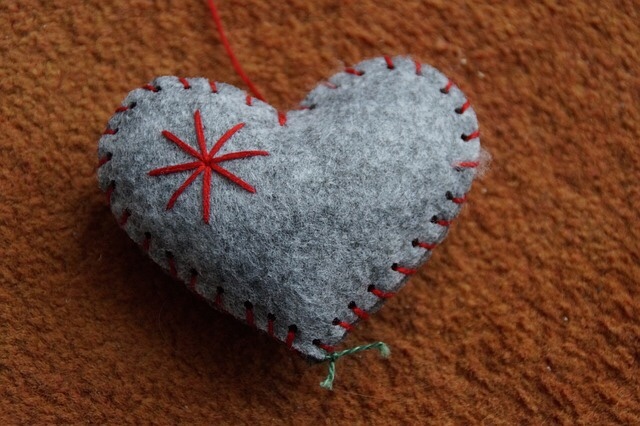 I made this one for Rosebud when she was an infant. I used shells, acrylic jewels, glass marbles and glitter. Fill the bottle with water, ceil the top and your child will have some quiet time looking for and watching the objects floating around. 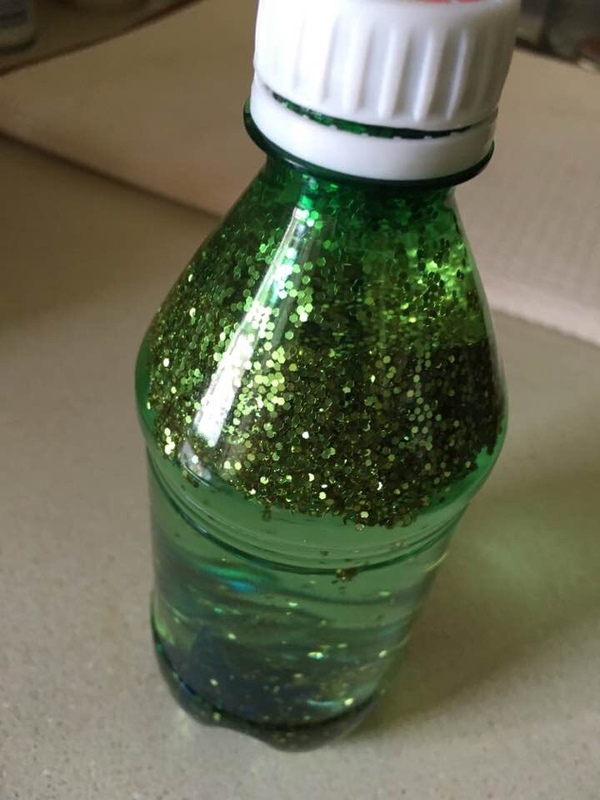 Sensory bottles can be loud depending on what you put in them, but other quiet ideas include pompoms of different colors, sand with shells, foam numbers and letters, or vegetable oil and water which can be interesting because the two substances don’t mix. Sensory bottles can be done in any theme. Here are some really cool sensory bottles I’ve found. Felt boards are great for stories, rhymes and even learning about the seasons. In our preschool room, we had felt parts of a tree and flowers and the kids could make a felt garden. You can use a felt board to work on sight words with letters. They also have felt doll dress up sets. You must be thinking that blocks can’t be a quiet activity, but hear me out. Last year, I found some great foam blocks that I gave to Rosebud for Christmas. When she is building alone with these and is concentrating on what she is building, it can be very quiet. The other great thing about this activity is they can do this on their own. I had to share this image. 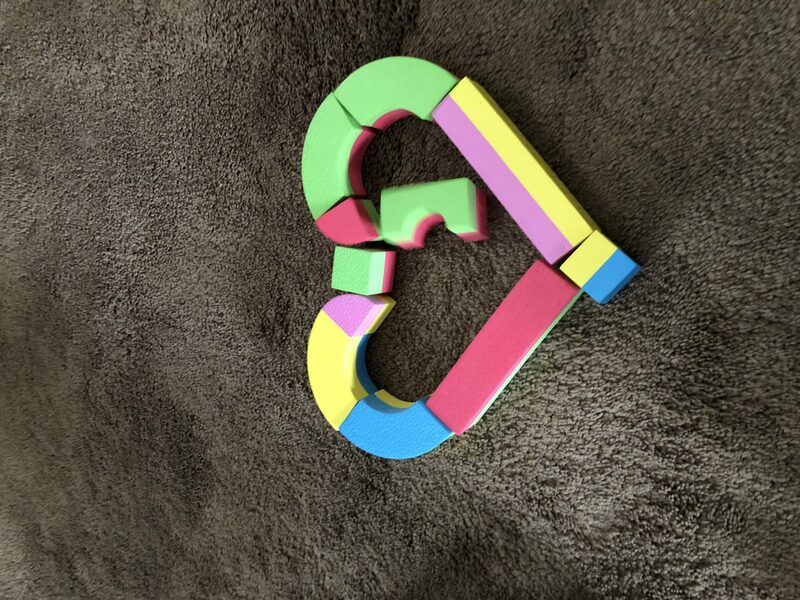 We were building today and I figured out how to put some of the shapes together to make a heart. I asked Rosebud if I could take a photo of it and she said, “Of course.” Each time I went to take a photo, she’d throw another block in the middle of the heart. On my phone, I have the live photo feature enabled so when I click on it, I see the block being thrown in the middle of the heart. 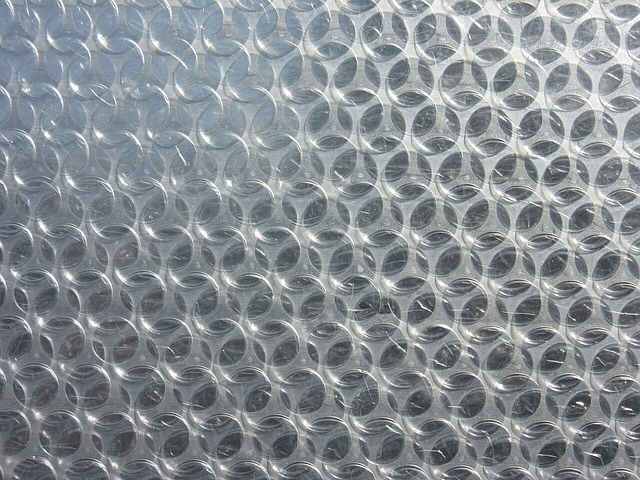 This obviously can be very loud, especially if you have the bubble wrap with larger bubbles, but I have found that the bubble wrap with smaller bubbles is great for small hands. The pops are relatively quiet. If you are watching TV, preparing a meal or are engrossed in a phone conversation, you probably won’t even hear the little pops. This is a great activity for developing those fine motor skills and concentration. After you show them how it works a couple of times, they can do this activity without help. 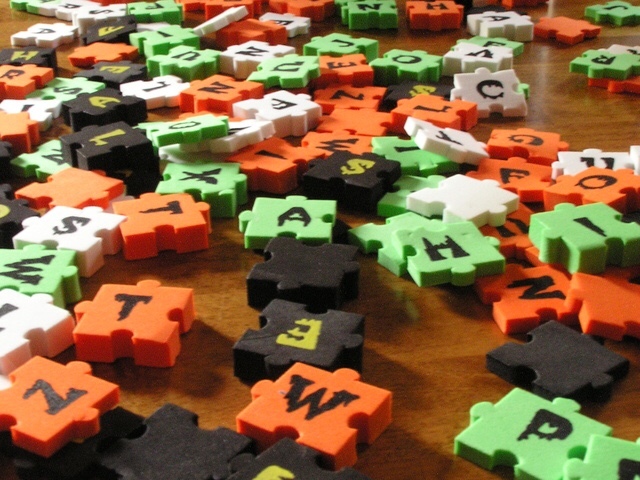 There are lots of puzzles to choose from, but the quietest are foam puzzles. If puzzles are at the appropriate developmental level for your child, they should be able to figure them out on their own. I usually show Rosebud a couple of times and then she gets it. She loves knowing that she can put them together herself. This is also another great activity for developing fine motor skills and concentration. These activities are great for a nap time when a child doesn’t sleep. They are also great for a quiet corner or for those times when a child is so wound up and needs to relax. 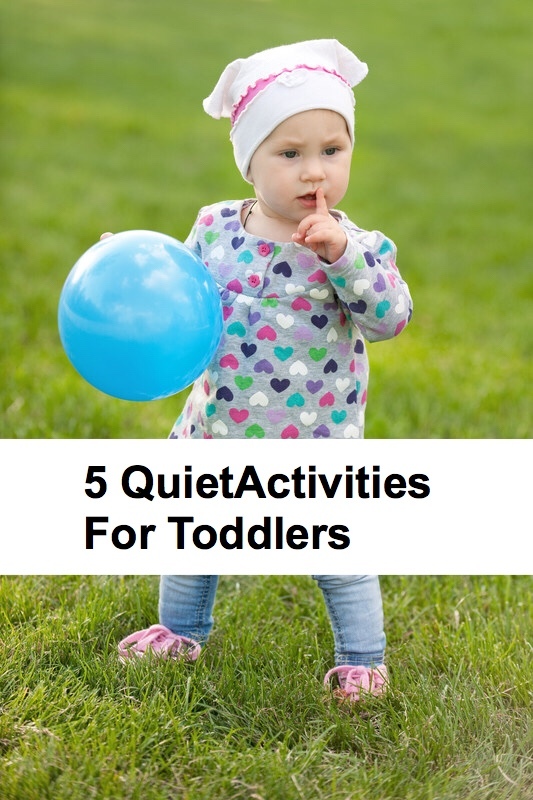 What are your favorite quiet time activities for kids? Tell me in the comments. We have those foam blocks and love them! Yes indeed, children are super noisy and quiet time is a necessity!! Thank you for your comment.We love the foam blocks. The only thing I don’t like is that they have a bunch of teeth marks now because she’s put them in her mouth. Other than that, they are great. We almost need a second bag so that she can build something more complicated. These are all great ideas and will be so much fun for me to make and enjoy her enjoy her quiet time. This is perfect for stay at home and work at home moms. It keeps them busy while engaging them to learn, use motor skills, and it sparks their curiosity. Thank you for your comment. I love that I can keep her busy and still get a few things done. I was inspired to write this post because she doesn’t like naptime on a lot of days and doesn’t sleep so I need to find something to keep her busy but kind of resting at the same time. Some of these things are also great in public like in restaurants or waiting rooms. We do puzzles often too. My 5 year old just started doing 1000 piece ones with me and he’s surprisingly good. He also really likes Kinex and that is totally a calming activity for him, it takes so much concentration! Last week we made aromatherapy play dough. Let them choose their own scents. I was surprised at how calm my kids were playing with it after. Oh and when the kids are being crazy when I’m prepping dinner, I put them to work. They LOVE helping and I find it calms them as well (slows the process a bit, but it’s less insane). Thank you for your comment. I have my daughter work with me in the kitchen as well. She loves to help me cook. I’ll have to try aroma therapy play-dough. I’m sure she’d love that. My kids LOVE blocks so we use that one a lot. But I think my 9 month old would also love the sensory bottles. I’ll have to try it out! The sensory bottles are fun because you can put almost anything in them. Thank you for your comment. Fabulous list! I LOVE that these are all quiet activities. My kids play beautifully, but they are so loud and sometimes it is nice to have 5 minutes of silence. Thanks so much for linking, I didn’t know there was even such a thing as a foam storyboard. I’m glad you liked the post. We use the felt story boards all the time in our classrooms. 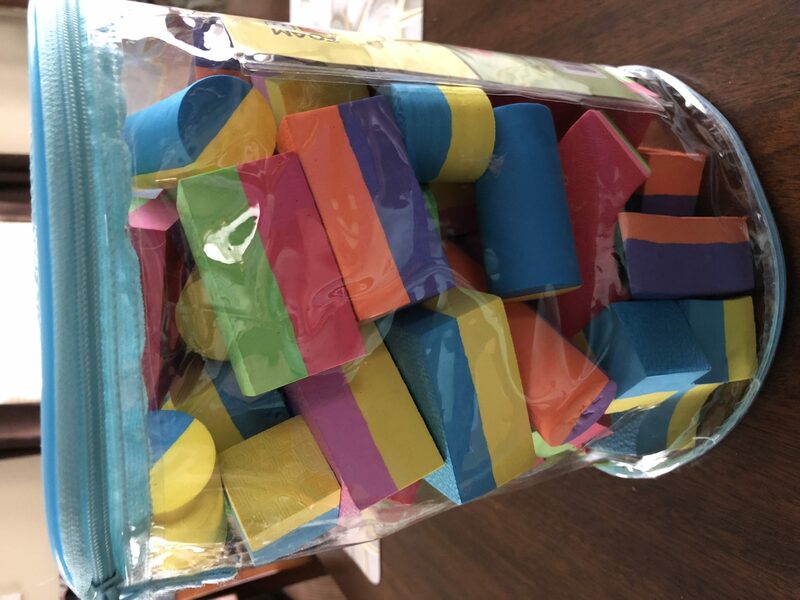 Not only are they quiet, but they also make reading stories more interactive and fun if you have the book and felt pieces to go along with it. Now that my daughter is three and can follow along with stories better, I’ll definitely be buying her some of these sets. Thank you for your comment.